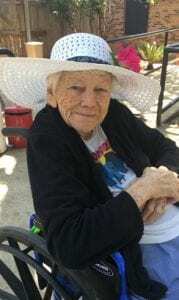 Laurel Lee Dickey, 93, passed away August 22, 2017 in Pleasanton, Texas. She was born in Sweetwater, Texas to David P. and Minerva (Weems) Sayle. Laurel married Marvin Dickey in 1939. They moved to California then to Arizona in 1951, where she became a foster parent. Over the years, she enjoyed collecting rocks and doing landscaping. In 2013, Laurel moved back to Texas. Her greatest joy were her grandchildren and being with her family especially during the holidays. She is survived by her son Robert A. Dickey, Sr., grandchildren LeighAnne Ervien and husband Darrick, David Dickey and wife Diane, Anthony Dickey and wife Amber, Robert A. Dickey, Jr. She is also survived by 13 great-grandchildren, three great-great-grandchildren and numerous nieces and nephews. Anyone wanting to leave condolences, memories or sign the online book please do so at www.hurleyfuneralhome.com.